Cancelling an enormous debt makes an enormous statement. As we move from mercy to forgiveness, we see they are intertwined yet distinctive. Mercy can be extended to anyone without even their knowledge but forgiveness involves a transaction. Matthew 18:23-35 is a compelling parable that ought to send chills down your spine. In verse 35, Jesus steps out of the parable and makes this pronouncement: “So also my heavenly Father will do to every one of you, if you do not forgive your brother from the heart.” Note that it is not just saying “I forgive you” but it involves so much more. 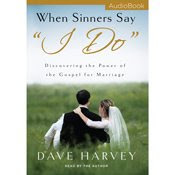 As a pastor I shout a big “AMEN” to Pastor Harvey that the subject of forgiveness is the most misunderstood and misapplied means of grace in marriage. Read this chapter to change this in your marriage. 1. What have you learned about forgiveness from the chapter that you did not know before? 2. Have you ever done something to someone else and not been forgiven for it? How does it affect your relationship with that person? 3. Considering the story of Jeremy and Cindy, though you may or may not have experienced the reality of adultery in your marriage, are there things they said or did that you do identify as similar points in your own marriage? 4. What are some of the 100 denari (small things) that you do against your spouse? Do you rationalize them? Do any of the following statements sound familiar in your vocabulary? When you use comments like this, why do they not make as much sense to your spouse as they do to you?